Fixing free aluminium panel surface – ideal for shops, clubs & events. Reversible panels – 4 messages in 1. Dark oak finish with matt varnish protection on the wood frame. 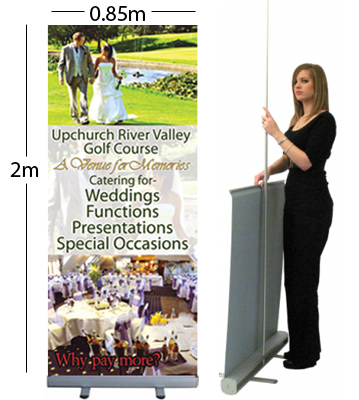 A lightweight display that are ideal for exhibitions or promotional events. Aluminium casing with a printed pvc material panel. Display panel width 0.85m x 2m. Carry case with every unit. Easy to unload and erect, easy to dismantle and pack away. The panels can be changed on these units, so buy once and re-use for future shows. Full colour, photo quality artwork to help sell your goods or services. Price is dependent upon style of artwork and graphics fitted to both sides and excludes delivery.